Bacterial persistence or refractory recurrent lower urinary tract infections. Urethroscopy can also be used to facilitate treatment of stress urinary incontinence due to intrinsic sphincter deficiency with urethral bulking. The term cystourethroscopy is used occasionally throughout this chapter, as the bladder and urethra are often examined concomitantly, however, this chapter focuses primarily on the assessment of the urethra. 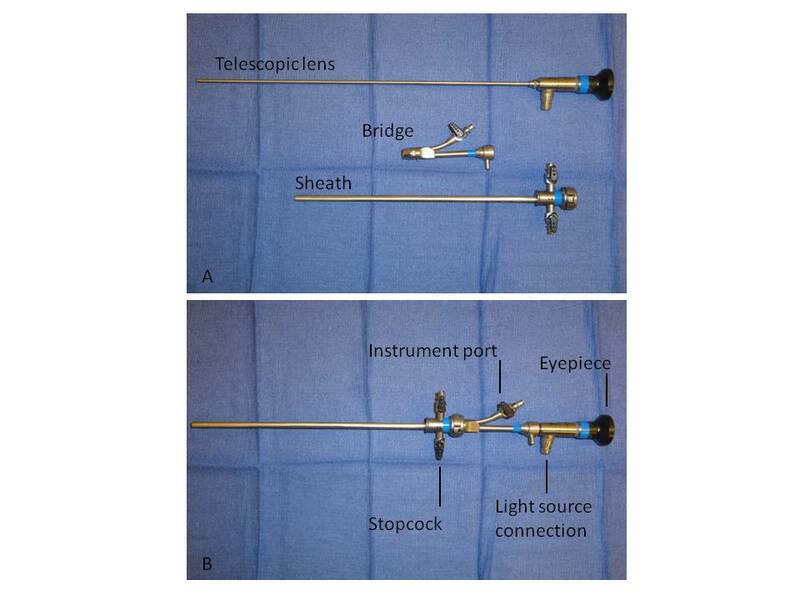 We recommend the use of a zero-degree, rigid urethroscope for both diagnostic and operative urethroscopy based on the short length of the female urethra and the primary need for straightforward visualization of the urothelium (Fig. 1). The rigid, telescopic lens that comprises the urethroscope is first placed through a bridge which is positioned against and locked onto the urethroscope’s eyepiece. The bridge may contain a port through which operative instruments may be inserted. The telescopic lens is then inserted into a 16–24 French (5.3–8 mm in diameter) sheath, the diameter of which is intended to facilitate ease of introduction into the urethra while preventing loss of distention media at the urethral meatus. The distal end of the sheath sits flush to the end of the objective lens around the entire circumference of the urethroscope to allow safe retrograde insertion of the scope during direct visualization of the urethra. The sheath houses one or two stopcocks through which distention media can be introduced when tubing is attached. The stopcocks can similarly be opened in order to drain instilled fluid within the bladder or to obtain bladder washings for cytology. A fiberoptic light source is attached to the proximal portion of the telescopic lens via insulated tubing. In manipulating the fiberoptics, care should be taken to not twist or bend the cable as this can result in fibers being damaged or broken. With the light source on, the operator can visualize the urothelium either by placing an eye directly against the eyepiece or by connecting a camera to it. Camera use enables one to capture images if needed and it additionally allows patients to make a visual connection between their symptoms and any pathology described by their physician. Fig. 1. Urethroscope components separated (A) and assembled for use (B). The labia are separated, and the urethral meatus is swabbed with either povodine-iodine or chlorhexidine gluconate to reduce the introduction of vulvovaginal bacterial flora into the urethra. Providers may choose to apply 2% lidocaine gel into the urethra. It is unclear, however, whether the use of a 2% lidocaine gel effectively mitigates pain associated with urethroscopy. Several randomized-controlled trials have failed to show a significant reduction in pain with the use of intraurethral 2% lidocaine gel in women undergoing cystoscopy as compared to nonanesthetic gels.1, 2, 3 On the contrary, a randomized-controlled trial by Choe et al.4 demonstrated a significant reduction in pain with the use lidocaine gel. An optimal anesthetic volume and application time have yet to be established for female patients. We recommend the use of intraurethral 2% lidocaine gel for 10 min before proceeding with urethroscopy. The urologic and urogynecologic literature have not commented on whether the use of anesthetic gels reduces posturethroscopy urinary urgency, urinary frequency, or dysuria. The water flow to the zero-degree urethroscope is first turned on, and the urethroscope is then placed through the urethral meatus and advanced to the urethrovesical junction. It is important to ensure that the urethroscope is inserted along the naturally occurring axis of the urethra and that this angle is maintained throughout the evaluation. Adherence to this principle will reduce patient discomfort and movement, improve visualization, and allow for a more rapid conclusion to the test. Continuous water flow is applied to maintain urethral patency at 80 mL/min. Once at the urethrovesical junction, slowly advance the urethroscope into the bladder to allow for visualization of the bladder trigone, which is located along the distal, posterior wall of the bladder between the ureteral orifices. The purpose of doing so is to assess the trigone. One may commonly see squamous metaplasia of the trigone, which appears as white patches of tissue. Squamous metaplasia of the trigone can be associated with chronic inflammation of the urethrovesical junction5, 6 which may account for irritative voiding symptoms. With the field of visualization spanning between the ureteral orifices, this is a convenient time to verify bilateral ureteral efflux. The urethroscope is then slowly withdrawn along the length of the urethra so that the urethrovesical junction and the proximal, mid, and distal urethra can be examined for inflammation, diverticula, foreign bodies, and neoplasia. In addition to squamous metaplasia of the trigone, erythema of the urothelium, shaggy inflammatory fronds, pseudopolyps, and exudate may also be indicative of chronic urethral inflammation and a condition known as chronic urethrotrigonitis (Fig. 2). This inflammation may account for irritative voiding symptoms, dyspareunia, urethral tenderness and/or urinary urgency with urethral palpation, and possibly a predisposition for recurrent urinary tract infections. Normal glandular orifices may be noted posteriorly from 3:00 to 9:00 position along the length of the urethra. Defects in the posterior and lateral aspects of the urothelium may represent communications with underlying urethral diverticula. Palpation of the distal, anterior vaginal epithelium with the urethroscope in place enables one to identify suburethral masses consistent with urethral diverticula. Of note, multiple diverticular orifices can exist along the urethra, diverticula can wrap around the urethra in a horseshoe fashion, and they can extend cephalad as well. A magnetic resonance imaging (MRI) study of the pelvis is recommended to assess the full dimensions and topography of a urethral diverticulum. In all patients with a history of an anti-incontinence surgery (Burch procedure, Marshall-Marchetti-Krantz procedure, midurethral sling, bladder neck sling) for stress urinary incontinence or the placement of mesh for anterior or apical vaginal support, it is necessary to evaluate the urethra and bladder for foreign bodies in those with irritative voiding symptoms (Fig. 3). Permanent sutures placed into the urethra or mesh erosion into the urethra may result in microscopic hematuria, recurrent lower urinary tract infections, irritative voiding symptoms, and tenderness or urgency on urethral palpation. Fig. 2. 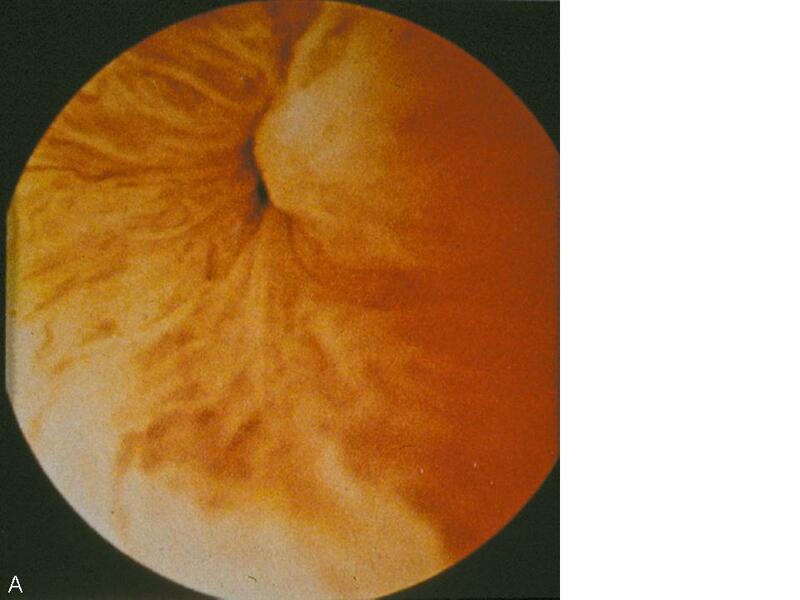 Urethral erythema indicative of chronic urethritis in a woman with irritative voiding symptoms. Fig. 3. 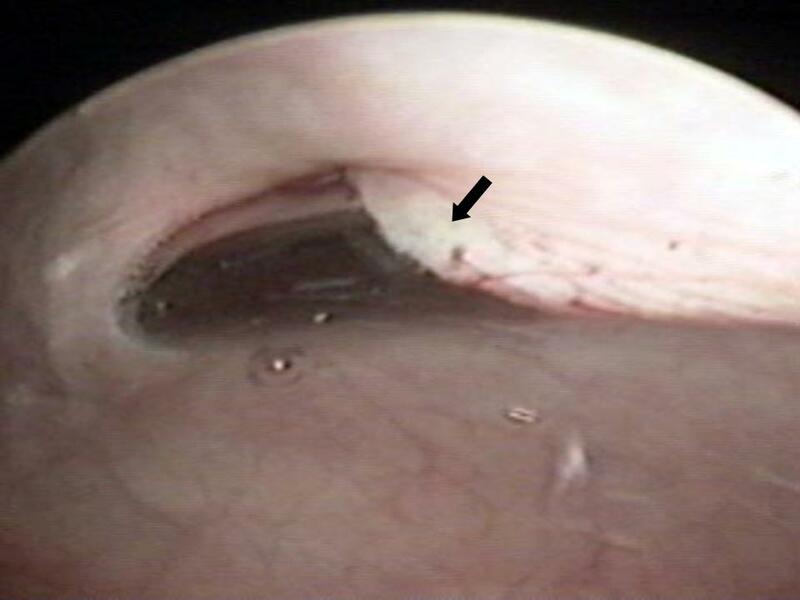 Midurethral sling erosion (black arrow) into the urethra in a woman with urinary urgency, urinary frequency, and dysuria. Microscopic hematuria is defined by the American Urological Association (AUA) as two of three clean-catch, midstream urine specimens yielding three or more red blood cells per high power field on microscopic urinalyses.7 For patients lacking an identifiable cause for persistent microscopic hematuria on cystourethroscopy, a computerized tomography (CT) urogram is recommended to evaluate the upper urinary tract for masses or calculi. Renal ultrasound or intravenous pyelography may also be alternatives for the evaluation of the upper tracts but do not yield as much information about the upper urinary tract and surrounding structures when compared to a CT urogram. Bladder washings for cytology should be obtained during concomitant cystoscopy. Urethral carcinomas, adenocarcinomas, and transitional cell carcinomas are rare. The identification of a lesion suspicious for a neoplasm warrants prompt evaluation by biopsy. The dynamic evaluation of the urethrovesical junction with cystometric filling involves recognition of a response pattern to a series of direct instructions.8 As the bladder fills, the urethrovesical junction symmetrically closes (Fig. 4A). During the filling process, the patient experiences three significant sensations: (1) the feeling of filling, (2) the sensation of fullness, and (3) the point of maximum fullness. At each of these cystometric landmarks the patient is given the following instructions: “hold your urine by contracting your pelvic floor muscles,” “cough,” and “strain.” This is carried out with the urethroscope in the proximal urethra to afford a full view of the urethrovesical response to the instructions. In the stress-continent patient, the urethrovesical junction symmetrically closes with filling. It remains closed with coughing or straining and descends minimally, if at all, with those instructions. Closure of the bladder neck occurs in response to holding and contracting her pelvic floor muscles. Opening may occur with a vesical contraction, but closure occurs with suppression of the contraction. These responses are all consistent with good anatomic support and maintenance of continence. In the patient with urodynamic stress urinary incontinence there is a lack of anatomic support at the urethrovesical junction. Thus, increased intra-abdominal pressure is transmitted disproportionately to the bladder to a greater degree than the proximal urethra, resulting in descent of the bladder neck and opening of the urethrovesical junction. Indeed this is precisely what is observed during dynamic urethroscopy. 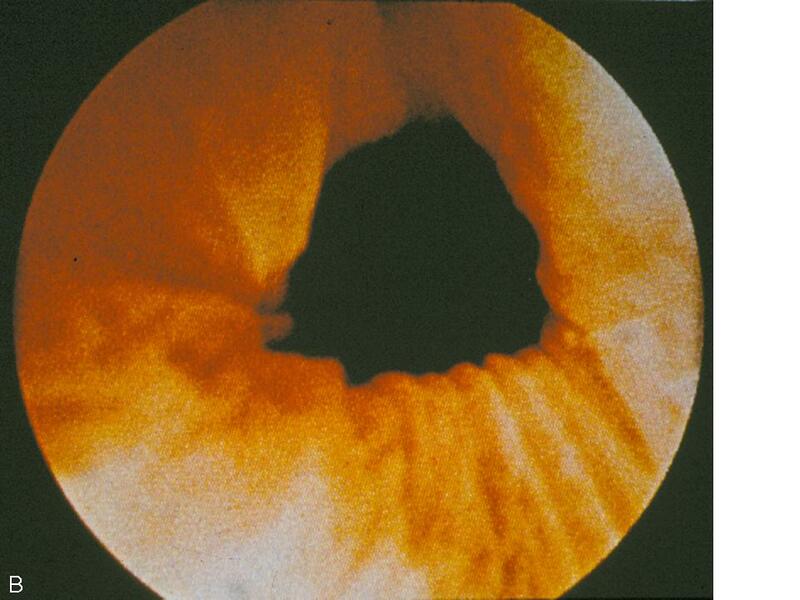 With filling, coughing, or straining, the urethrovesical junction descends and often opens (Fig. 4B). On the instruction to “hold your urine by contracting your pelvic floor muscles,” the urethrovesical junction sluggishly and incompletely closes. The response to a vesical contraction with suppression remains normal. The unstable bladder produces a unique response to dynamic testing. With filling, the urethrovesical junction closes and remains closed despite the increased pressure produced by coughing or straining. However, after a short delay following the provocation, a vesical contraction may occur. This produces opening of the urethrovesical junction that is not able to be overcome with voluntary contraction of the pelvic floor musculature. Thus, the mechanism of incontinence in these patients is detrusor overactivity with, involuntary vesical contractions triggered by an increase in intra-abdominal pressure. This vesical contraction cannot be suppressed, resulting in urine loss. Careful observation of the urethrovesical junction in response to this dynamic testing will provide support for the etiology of incontinence in most patients. Fig. 4. (A) Normal coaptation of the urethrovesicular junction with Valsalva. (B) Funneling of the urethrovesicular junction with Valsalva in a woman with stress urinary incontinence. Women with stress urinary incontinence due to intrinsic sphincter deficiency in the absence of urethral hypermobility or with mild urethral hypermobility may achieve continence with the use of urethral bulking agents.9, 10 A variety of substances such as bovine collagen, calcium hydroxylapatite, polyacrylamide hydrogel, pryolitic carbon-coated beads, polytetrafluoroethylene, silicone macroparticles, and polydimethylsiloxane may be injected transurethrally or periurethrally with the aid of a urethroscope. 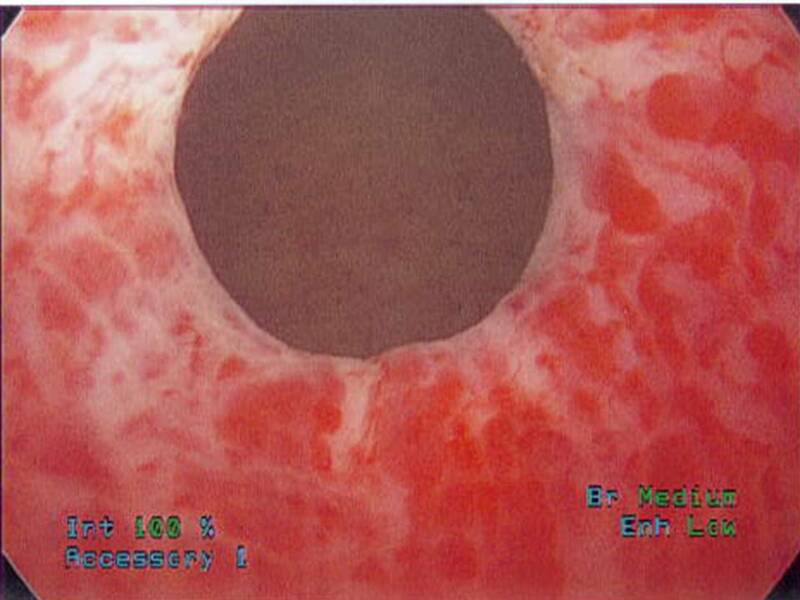 Prior to injection, dynamic urethroscopy is performed. The patient is asked to cough while visualizing the urethrovesical junction to demonstrate an inability to coapt the bladder neck with coughing and Valsalva. The bulking agent is then injected using either a syringe and spinal needle if performed periurethrally (Fig. 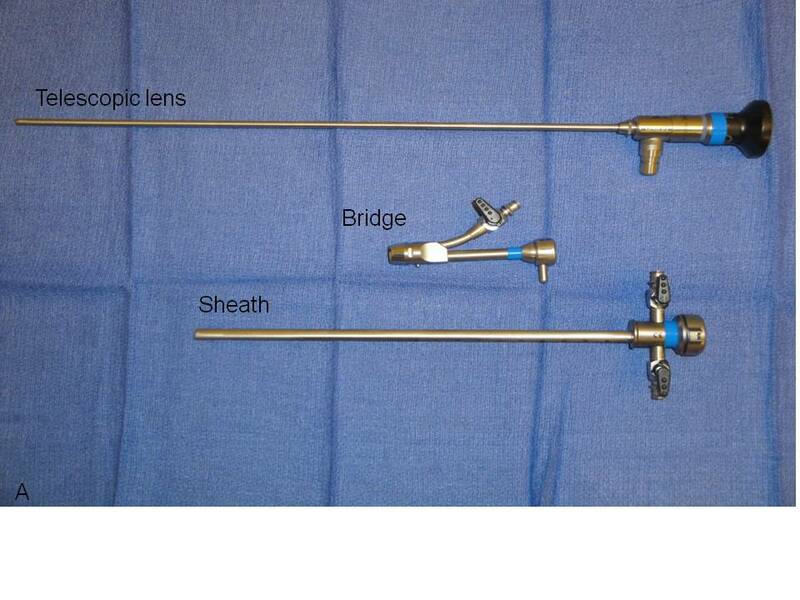 5) or a specialized needle designed for placement through the urethroscope if performed transurethrally. The agent is injected until urethral coaptation is achieved with Valsalva. Patients are monitored for urinary retention following bulking and undergo repeat urethroscopy and injection if stress urinary incontinence persists. Fig. 5. 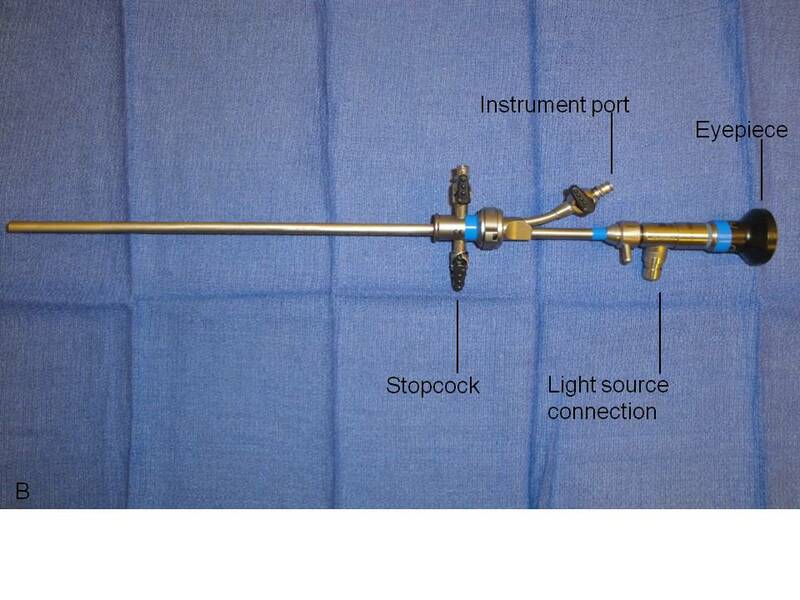 Periurethral injection of urethral bulking agent with a syringe while performing urethroscopy. The American Congress of Obstetricians and Gynecologists recommends intraoperative cystourethroscopy during pelvic organ prolapse repairs and anti-incontinence procedures in order to evaluate for intraoperative injury.11, 12 The urethroscopic portion of this procedure is performed in identical fashion to that described above for the office setting. Intraoperatively, where ureteral integrity is in question, the use of intravenous indigo carmine 5–10 min before endoscopy will aid in confirming ureteral integrity by observation of free efflux of dye form the ureteral orifices. The magnified view with a zero-degree urethroscope may make visualization of the ureteral orifices easier than using a 70-degree lens. The AUA 2008 Best Practice Policy Statement on Urologic Surgery Antimicrobial Prophylaxis13 recommends single-dose antibiotic prophylaxis following cystourethroscopy among patients with advanced age, anatomic anomalies of the urinary tract, poor nutritional status, a history of smoking, chronic corticosteroid use, immunodeficiency, externalized catheters, colonized endogenous/exogenous material, distant coexistent infection, or prolonged hospitalization. The AUA panel recommends the use of a fluoroquinolone or trimethoprim-sulfamethoxazole for prophylaxis, with alternatives including an aminoglycoside plus ampicillin, a first or second generation cephalosporin, or amoxicillin/clavulanate. It is not uncommon for women to experience urethral discomfort, urinary urgency, urinary frequency, and dysuria following urethroscopy, especially when there is inflammation in the urethra initially. A volume of 5 mL of 2% lidocaine hydrochloride jelly (20 mg/mL) can be placed into the urethra via a syringe to quell these postprocedure symptoms. Phenazopyridine hydrochloride (pyridium) 100–200 mg three times daily can be used for symptomatic relief of dysuria in women with normal renal function (glomerular filtration rate >80 mL/min). The medication can be given safely to women with glomerular filtration rates between 50 and 80 mL/min at an interval of every 8–16 h. Phenazopyridine should be avoided in women with glomerular filtration rates below 50 mL/min. For all patients, use should be limited to two consecutive days if antibiotics are being taken concomittantly.14 Patients should be counseled that phenazopyridine will result in an orange discoloration of the urine which may stain clothing or other porous materials it contacts. Protective pads should be used in incontinent women when using phenazopyridine. Stein M, Lubetkin D, Taub HC et al: The effects of intraurethral lidocaine anesthetic and patient anxiety on painperception during cystoscopy. J Urol. 1994 Jun;151(6):1518-21. Goldfischer ER, Cromie WJ, Karrison TG et al: Randomized, prospective, double-blind study of the effects on pain perception oflidocaine jelly versus plain lubricant during outpatient rigid cystoscopy. J Urol. 1997 Jan;157(1):90-4. Chen YT, Hsiao PJ, Wong WY et al: Randomized double-blind comparison of lidocaine gel and plain lubricating gel inrelieving pain during flexible cystoscopy. J Endourol. 2005 Mar;19(2):163-6. Choe JH, Kwak KW, Hong JH et al: Efficacy of lidocaine spray as topical anesthesia for outpatient rigid cystoscopy Urology. 2008 Apr;71(4):561-6. Epub 2008 Feb 15. CLARKE BG, GHERARDI GJ: Urethrotrigonitis or epidermidization of the trigone of the bladder: ahistologic, bacteriologic and clinical study. J Urol. 1962 Apr;87:545-8. Henry L, Fox M: Histological findings in pseudomembranous trigonitis. J Clin Pathol. 1971 Oct;24(7):605-8. Grossfeld GD, Wolf JS Jr, Litwan MS et al: Asymptomatic microscopic hematuria in adults: summary of the AUA best practicepolicy recommendations. Am Fam Physician. 2001 Mar 15;63(6):1145-54. Robertson JR: Dynamic urethroscopy. In Ostergard DR (ed): Gynecologic Urology and Urodynamics, Theory and Practice. p 135, Baltimore, Williams & Wilkins, 1982. Appell RA, Dmochowski RR, Herschorn S: Urethral injections for female stress incontinence. BJU Int. 2006 Sep;98 Suppl 1:27-30; discussion 31. Kotb AF, Campeau L, Corcos J: Urethral bulking agents: techniques and outcomes. Curr Urol Rep. 2009 Sep;10(5):396-400.
: ACOG Committee Opinion. Number 372. July 2007. The Role of cystourethroscopy in Obstet Gynecol. 2007 Jul;110(1):221-224.
: ACOG Practice Bulletin No. 85: Pelvic organ prolapse. Obstet Gynecol. 2007 Sep;110(3):717-29. Bhanot N, Sahud AG, Sepkowitz D: Best practice policy statement on urologic surgery antimicrobial prophylaxis. Urology. 2009 Jul;74(1):236-7. Product Information: PYRIDIUM(R) oral tablet, phenazopyridine hydrochloride oral tablet. Warner Chilcott, Inc, Rockaway, NJ, 2002.